Indonesia AirAsia Flight 8501 was a scheduled international passenger flight operated by Indonesia AirAsia – an AirAsia Group affiliate – from Surabaya, Indonesia, to Singapore. On 28 December 2014, the Airbus A320 flying the route crashed into the Java Sea, killing all 162 people on board. After search operations ended in March 2015, only 106 bodies were recovered. PK-AXC, the aircraft involved, photographed in April 2014. In December 2015, the Indonesian National Transportation Safety Committee (KNKT or NTSC) released a report concluding that a non-critical malfunction in the rudder control system prompted the captain to perform a non-standard reset of the on-board flight control computers. Control of the aircraft was subsequently lost, resulting in a stall and uncontrolled descent into the sea. Miscommunication between the two pilots was cited as a contributing factor. Flight path and location of debris. Flight path (red) is limited to range of Flightradar24 coverage; it does not reflect ATC coverage. After departure, Flight 8501 was in contact with the Jakarta Area Control Centre (callsign: "Jakarta Centre"), which provides air traffic control (ATC) service over the western Java Sea, and flying along air route M635, when it approached a line of thunderstorms off the southwest coast of Borneo. At 06:12, Flight 8501 was flying at flight level 320—approximately 32,000 ft (9,750 m)—when the cockpit requested and received permission to deviate left from its original flight path to avoid these storms. The pilot then requested to climb to flight level 380, which was deferred by ATC because of other aircraft in the vicinity. AirNav Indonesia, which operates the Jakarta Area Control Centre, reported that Jakarta Centre then cleared Flight 8501 to flight level 340 at 06:14,[d] but no response was received; other aircraft in the vicinity were asked to contact Flight 8501, but also did not receive a response. Between 06:17:00 and 06:17:54, the aircraft climbed from 32,000 to 37,000 ft (9,800 to 11,300 m), exceeding a climb rate of 10,000 feet per minute. The flight data recorder (FDR), showed the aircraft at 35,500 feet (10,800 m)—and still climbing—at 159 knots (294 km/h; 183 mph), which is below the stall speed for the airplane's weight at that altitude. The Indonesian Minister of Transport interpreted the apparent aircraft behaviour at peak altitude as an aerodynamic stall, when it began to descend at 06:17:54, descending 1,000 ft (300 m) within six seconds and 8,000 ft (2,400 m) within 31 seconds. The aircraft also began a turn to the left, forming at least one complete circle before disappearing from radar at 06:18:44. Its last recorded position was over the Java Sea, Karimata Strait between the islands of Belitung and Kalimantan (3°22′15″S 109°41′28″E﻿ / ﻿3.3708°S 109.6911°E﻿ / -3.3708; 109.6911﻿ (AirAsia Flight 8501 last transponder signal)). The aircraft crashed in the Java Sea, Karimata Strait between the islands of Belitung and Borneo (3°37′23″S 109°42′43″E﻿ / ﻿3.623°S 109.712°E﻿ / -3.623; 109.712﻿ (AirAsia Flight 8501 crash site)). The cockpit voice recorder captured multiple warnings, including a stall warning, sounding in the cockpit during the final minutes of the flight. No distress signal was sent from the aircraft. Search and rescue (SAR) operations were activated by the Indonesia National Search and Rescue Agency (Basarnas) from the Pangkal Pinang office. The aircraft was an Airbus A320-216,[e] with serial number 3648, registered as PK-AXC. 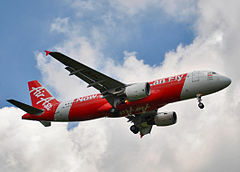 It first flew on 25 September 2008, and was delivered to AirAsia on 15 October 2008. The aircraft was 6 years old and had accumulated approximately 23,000 flight hours over 13,600 flights. It had undergone its most recent scheduled maintenance on 16 November 2014. The aircraft was powered by two CFM International CFM56-5B6 engines and was configured to carry 180 passengers. AirAsia released details of the 155 passengers which included 137 adults, 17 children, and one infant. The crew consisted of two pilots and four flight attendants. A company engineer was also on board and was not counted as one of the passengers. Captain Iriyanto,[i] age 53, an Indonesian national, had a total of 20,537 flying hours, of which 6,100 were with Indonesia AirAsia on the Airbus A320. The captain began his career with the Indonesian Air Force, graduating from pilot school in 1983 and flying jet fighter aircraft. He took early retirement from the air force in the mid-1990s to join Adam Air, and later worked for Merpati Nusantara Airlines and Sriwijaya Air before joining Indonesia AirAsia. First Officer Rémi Emmanuel Plesel, age 46, a French national, had a total of 2,247 flying hours. He was originally from Le Marigot, Martinique, and had studied and worked in Paris. He was living in Indonesia. Forty-one people who were on board the AirAsia flight were members of a single church congregation in Surabaya. Most were families with young children travelling to Singapore for a new year's holiday. The bodies began to be returned to their families on 1 January 2015. At that time, the East Java Regional Police Department's Disaster Victim Identification commissioner stated that the victims were identified by the means of post mortem results, thumb prints, and their personal belongings. Shortly after the aircraft was confirmed to be missing, unconfirmed reports stated that wreckage had been found off the island of Belitung in Indonesia. Indonesia's National Search and Rescue Agency (Basarnas) deployed seven ships and two helicopters to search the shores of Belitung and Kalimantan. The Indonesian Navy and the provincial Indonesian National Police Air and Water Unit each sent out search and rescue teams. In addition, an Indonesian Air Force Boeing 737 reconnaissance aircraft was dispatched to the last known location of the airliner. The Indonesian Navy dispatched four ships by the end of the first search day and the Air Force deployed aircraft including a CASA/IPTN CN-235. The Indonesian Army deployed ground troops to search the shores and mountains of adjacent islands. Local fishermen also participated in the search. Ongoing search and rescue operations were under the guidance of the Civil Aviation Authority of Indonesia. The search was suspended at 7:45 pm local time on 28 December due to darkness and bad weather, to be resumed in daylight. An operations center to coordinate search efforts was set up in Pangkal Pinang. The search area was a 270-nautical-mile (500 km) radius near Belitung Island. Search and rescue operations quickly became an international effort. By 30 December naval and air units from Singapore, Malaysia and Australia had joined Indonesian authorities in patrolling designated search areas. Singapore's Rescue Coordination Centre (RCC) deployed three C-130 Hercules aircraft to aid in the search and rescue operation. A Formidable-class frigate, a Victory-class corvette, a Landing Ship Tank, and a submarine support and rescue vessel subsequently took part in the search and rescue after Indonesia's National Search and Rescue Agency accepted the offer of help from the Republic of Singapore Navy. Singapore's Ministry of Transport provided specialist teams from the Air Accident and Investigation Bureau and underwater locator equipment. The Malaysian government set up a rescue coordination centre at Subang and deployed three military vessels and three aircraft, including a C-130, to assist in search and rescue operations. Australia deployed a P-3 Orion to assist in the search and rescue operation. Elements of the United States Navy joined the search effort; USS Sampson arrived on station late on 30 December, and USS Fort Worth on 3 January. By 5 January, 31 bodies had been recovered with the aid of the Russian and the US search teams. Divers entered the main section of the fuselage underwater and discovered 6 bodies on 24 January. More than ninety vessels and aircraft from Indonesia, Singapore, Malaysia, Australia, South Korea, Japan, China, the United States, and Russia participated in the search. This fleet included three ships with underwater detectors and two fuel tankers seconded to ensure efficient operation of the vessels in the search area. On 2 January the Indonesian Ministry of Transport reported that two other Indonesian tender vessels had been fitted with equipment which could detect acoustic signals from the flight recorder ("black box") beacons and airframe metal, as well as multibeam side scan sonar. The official search for bodies ended on 17 March, after 106 bodies had been recovered. 56 bodies remained unaccounted for. A live Reddit feed that was constantly updating the details of the search and recovery efforts, leaked details of the operation. An April press conference revealed details discovered by the Basarnas rescue team divers. 115 remains (including body parts) were recovered. 111 of them are believed to be from 99 passengers. On the day of the disappearance, a fisherman observed "a lot of debris, small and large, near Pulau Tujuh. [...] It looked like the Air Asia colours." Another fisherman reported that, while moored on Sunday at Pulau Senggora, south of the town of Pangkalan Bun in Central Kalimantan, "Around 7 am, I heard a loud booming sound. Soon afterwards, there was haze that usually happened only during the dry season. [...] Before the exploding sound, my friends saw a plane from above Pulau Senggaro heading towards the sea. The plane was said to be flying relatively low, but then disappeared." On 31 December, Basarnas claimed that a sonar image obtained 30 December by an Indonesian naval ship appeared to show an aircraft upside down on the seabed in about 24–30 m (80–100 ft) of water, about 3.2–3.5 km (2.0–2.2 mi) from the debris found on 30 December. The head of the Search and Rescue Agency also denied the existence of any sonar images of the wreckage (as well as the reported recovery of a body wearing a life vest). He stressed that only official information from his search-and-rescue service can be considered to be reliable. On 2 January 2015, Basarnas reported evidence of a fuel slick on the water surface in the search area, but detection of the fuselage remained unconfirmed. At a press conference given on the morning of 3 January by Basarnas, the discovery of two large submerged objects was reported: 9.4 m × 4.8 m × 0.4 m (30.8 ft × 15.7 ft × 1.3 ft), and a thin object 7.2 m × 0.5 m (23.6 ft × 1.6 ft). Also, the previously reported fuel slick was confirmed. A later media report mentioned four large sections of wreckage, the largest being 18 m × 5.4 m × 2.2 m (59.1 ft × 17.7 ft × 7.2 ft) located at 3°55′27″S 110°31′31″E﻿ / ﻿3.9242°S 110.5252°E﻿ / -3.9242; 110.5252﻿ (AirAsia Flight 8501 first wreckage). Later in the day, Basarnas announced no more bodies were found, leaving the total at 30. On 7 January, divers found parts of the aircraft, including a section of the tail. Other sections of the tail are expected to lie nearby. On 10 January divers used an inflatable device to bring the aircraft's tail to the surface of the sea. They continued to search the sea floor within 500 m (1,600 ft) of where faint pings were heard. The flight data recorder was recovered by Indonesian divers on 12 January at 3°37′21″S 109°42′42″E﻿ / ﻿3.6225°S 109.7117°E﻿ / -3.6225; 109.7117﻿ (AirAsia Flight 8501 FDR salvage), within 4 km (2.5 mi) of part of the fuselage and tail. Later in the day, the cockpit voice recorder was located and was recovered the following day. On 14 January, the Republic of Singapore Navy Submarine rescue vessel Swift Rescue located a large section of the fuselage with one wing attached. On 25 January, ropes around the fuselage snapped during an initial failed effort to raise the wreckage. Four bodies were recovered, taking the total recovered to 69. More bodies were thought to be inside. Rear Admiral Widodo, who is in charge of recovery operations, said that the fuselage might be too fragile to be lifted. On 27 February salvage workers recovered a large piece of fuselage, including the wings, of the A320. Lifting balloons were used to lift the fuselage, but the first attempt failed as the balloons deflated. By March 2015, all large pieces of fuselage from the jet had been lifted from the seafloor and moved for investigative purposes. An emergency call center was established by the airline for the families of those who were on board the aircraft, and an emergency information center was set up at Juanda International Airport to provide hourly updates as well as lodging for victims' relatives. Smaller posts were also opened at Soekarno–Hatta International Airport and Sultan Hasanuddin International Airport. On 31 December 2014, Indonesia AirAsia retired the flight number QZ8501, changing the designation of its Surabaya-Singapore route to QZ678. The return flight number was also changed, from QZ8502 to QZ679. Subsequent to the 1 December 2015 NTSC report as to the causes of the crash, the airline said it had already implemented improved pilot training. AirAsia did not have any official permission to fly the Surabaya–Singapore route on Sunday – the day of the crash – but was licensed on four other days of the week, and, according to an Indonesian Ministry of Transport statement, "The Indonesian authorities are suspending the company's flights on this route with immediate effect pending an investigation." In response on the same day, the Civil Aviation Authority of Singapore (CAAS) and the Changi Airport Group (CAG) made a clarification that AirAsia QZ8501 "has been given approval at Singapore's end to operate a daily flight for the Northern Winter Season from 26 October 2014 to 28 March 2015". On 6 January 2015, Indonesian Ministry of Transport representative Djoko Murjatmojo stated that "officials at the airport operator in Surabaya and [the] air traffic control agency who had allowed the flight to take off had been moved to other duties", and an immediate air transport directive had been issued "making it mandatory for pilots to go through a face-to-face briefing by an airline flight operations officer on weather conditions and other operational issues prior to every flight". The loss of Flight 8501 also brought attention to the lack of weather radar at Indonesian air traffic control centres. According to the Toronto Star, "Indonesia’s aviation industry has been plagued with problems ... pilot shortages, shoddy maintenance and poor oversight have all been blamed following a string of deadly accidents in recent years." The West Kotawaringin administration in Pangkalan Bun, Central Kalimantan, planned to build a memorial for the Air Asia flight which also doubles as a monument for aviation safety. Central Kalimantan deputy governor Achmad Diran also stated that the monument is also going to be the symbol of gratitude and appreciation for the efforts of the National Search and Rescue Agency. The cornerstone ceremony took place on Wednesday, and was attended by local and state officials and representatives from Australia and Singapore. West Kotawaringin regent Ujang Iskandar stated that "With this monument, we hope that the families and the government will lay flowers every 28 December, and continue the dialogue on aviation safety in Indonesia." On 22 March, there was a gathering of people near the site of the crash and the crowd laid flowers around. Air Asia has reportedly offered US$32,000 or Rp300 million to each of the grieving family members of the victims of the accident as 'initial compensation from an overall part of compensation, Wall Street Journal claimed from a letter on Air Asia stationery dated 2 January grieving family member David Thejakusuma received; who had 7 family members on the flight, the amount for each family member he lost. On 16 March 2015, Monash University awarded in the form of posthumous title (award of posthumous degree) the Bachelor of Commerce to one of the late crash victims, Kevin Alexander Sujipto. Professor Colm Kearney, Dean of the Faculty of Business and Economics presented it to a member of his family. A memorial service was held alongside the presentation of the award, and was attended by the Consul General of Indonesia for Victoria and Tasmania, Dewi Savitri Wahab, 40 of the deceased's friends and representatives from the Indonesian Student Association in Australia (PPIA) Monash University branch. On 28 December 2015, the first anniversary of the crash, a private prayer service was held in a private room in Mahameru Building, East Java Regional Police, Surabaya, and was attended by family members and relatives of the victims of the crash. The service was also attended by the Head Chief of the Search and Rescue Agency Henry Bambang Soelistyo. Representatives from the family members asked the National Transportation Safety Committee to ensure the safety of air travel in Indonesia. The Indonesian Government was also asked by the family members to ratify the Montreal Convention, finally ratified on 19 May 2017. France opened a criminal investigation to investigate possible manslaughter charges. The family of the first officer, a French national, have filed a lawsuit against AirAsia in connection to the lack of permission to fly on that day, claiming the airline was "endangering the life of others". Surabaya Mayor Tri Rismaharini says her administration is ready to sue AirAsia should it ignore the rights of the families of passengers on flight QZ8501, following the suspension of the airline’s flight permit from the East Java city to Singapore. Risma said her administration had also consulted with legal experts from Airlangga University on the fears of most families regarding the difficulties in disbursing insurance funds, after the Transportation Ministry regarded the Surabaya-Singapore flight on Dec. 28 as illegitimate. She said her administration continued to collect data on the victims, including their valuable belongings. The data would later be used for insurance purposes and matters related to the beneficiary rights of the affected families. A US-based aviation lawyer was planning to sue AirAsia claiming that they are "representing" 10 families over an aircraft malfunction following the crash of Flight QZ8501. Principal of Chicago-based Wisner Law Firm Floyd Wisner said that although preliminary investigations found that weather was a factor, the Airbus A320-200 suffered a malfunction of the fly-by-wire system. According to the statement, the lawsuit, which was filed in the US state of Illinois, states that “at the time the accident aircraft left the control of defendant Airbus, it was defectively and unreasonably dangerous,” and names Honeywell International, Motorola Inc and other suppliers along with Airbus as defendants. The case was Aris Siswanto et al. v Airbus, SAS et al., 1:15-cv-05486. U.S. District Court, Northern District of Illinois (Chicago). On 30 June 2015, the suit had still named only Airbus and its suppliers but AirAsia was to be added as a defendant, according to Floyd Wisner of the Wisner law firm. However on 9 December 2016, the case was dismissed and the lawsuit was dropped. Following the recovery of the flight recorders, on 12 and 13 January, an anonymous International Civil Aviation Organization (ICAO) representative said, "The time has come that deployable recorders are going to get a serious look." Unlike military recorders, which jettison away from an aircraft and float on the water, signalling their location to search and rescue bodies, recorders on commercial aircraft sink. A second ICAO official said that public attention had "galvanized momentum in favour of ejectable recorders on commercial aircraft". Indonesia's tourism was badly affected by the accident. According to the head of Indonesia's Central Statistics Agency (CSA) Suryamin in a press conference at his office on 1 April 2015, the accident caused the number of foreign visitors to decline. Figures from the Indonesian Ministry of Tourism showed that the number of incoming foreign tourists at Surabaya's Juanda Airport declined by 5.33%, Jakarta's Soekarno-Hatta International Airport by 15.01%, and Bandung's Husein Sastranegara Airport by 10.66%. The events leading to the crash were investigated by Indonesia's National Transportation Safety Committee (KNKT or NTSC). Assistance was provided by Australia, France, Singapore, and Malaysia. Acting director of Air Transportation, Djoko Murjatmodjo, clearly stated that the investigation of the flight route and the investigation of the crash itself are separate. Murjatmodjo said that "AirAsia is clearly wrong because they didn’t fly at a time and schedule that was already determined." Both Singapore’s civil aviation authority and the Changi Airport Group stated that Air Asia was allowed daily flights between Surabaya and Singapore. Tatang Kurniadi, head of Indonesia’s national transportation safety committee, stated that sabotage was ruled out as a cause of the accident by the black boxes, and a preliminary report was supposedly submitted to the International Civil Aviation Organisation by early February. FDR data at the time of the stall showing sidesticks dual input. The captain is pushing down (Left, +10), the co-pilot is pulling up (Right, −10), which resulted in no movement of the elevator control surfaces (= 0) and the plane kept stalling until the end of the blackbox recording. After studying the wreckage of the Airbus A320-216 as well as the two black boxes and the cockpit recorder, Indonesia's National Transportation Safety Committee issued a report with their conclusions from the investigation on 1 December 2015. The report stated that the sequence of events that led to the crash started with a malfunction in two of the plane’s rudder travel limiter units (RTLU). A tiny soldered electrical connection in the plane's RTLU was found to be cracked, likely for over a year, causing it to intermittently send amber master caution warnings to the electronic centralised aircraft monitor (ECAM)—with the plane's maintenance records showing that the RTLU warning had been sent 23 times over the previous year, but was always solved (and never further investigated, which could have addressed the underlying electrical problem) by resetting the RTLU system. On this flight, the RTLU issue sent an amber caution warning four different times, and the first three times that the ECAM system gave the warning "Auto Flight Rudder Travel Limiter System", the pilot in command followed the ECAM instructions, toggling the flight augmentation computer (FAC) 1 and 2 buttons on the cockpit's overhead panel to off and then on. This procedure did clear the amber master caution warnings for each of those first three warnings. Specifics in the report indicate that French First Officer Rémi Emmanuel Plesel was at the controls just before the stall warning sounded in the cockpit indicating that the jet had lost lift. Investigators also found that, just moments earlier—on the fourth occurrence of the RTLU warning during the flight—the Captain chose to ignore the procedure advised by the ECAM instructions, and, instead, left his seat and reset the circuit breaker of the entire FAC, unintentionally disengaging multiple flight control systems, which would have to be turned on by the pilots after the circuit breakers are reset. This circuit breaker is not on the list of circuit breakers that are allowed to be reset in flight, and disabling both FACs placed the aircraft in alternate law mode, disengaging the autopilot and stopping the automatic stall protection and bank angle protection. The FAC is the part of the fly-by-wire system in A320 aircraft responsible for controlling flight surfaces including the rudder. Without the FAC's computerized flight augmentation, pilots would have to "rely on manual flying skills that are often stretched during a sudden airborne emergency". When the crew was required to fly the Airbus A320 manually, there was an unexplained nine-second delay between the start of the roll and either pilot attempting to take control. After nine seconds, the aircraft was banking at a 54° angle. The report did not specifically conclude that pilot error caused the crash while detailing the chain of events leading to the loss of Flight 8501. However, one of the investigators, the NTSC's Nurcahyo Utomo, referred to an apparent miscommunication between the pilots (based on the recordings on the cockpit voice recorder) and said that the malfunction should not have led to a total loss of control had they followed the recommended procedure. On 3 December 2015, Indonesia's air transportation director general, Suprasetyo, said that the National Safety Transportation Board (KNKT) had provided recommendations as to tightened controls on aircraft maintenance and flight crew competence. He added that the government had implemented "... a series of corrective actions as a preventive measure so that the same accident will not happen again in the future." Suprasetyo also confirmed that the suspension of Indonesia AirAsia's Surabaya–Singapore route would not be lifted until the carrier had completed the steps recommended by the KNKT. The report stated that the crash resulted from the flight crew’s inability to control the aircraft in alternate law. The cracking of a solder joint resulted in the failure of the Rudder Travel Limiter Unit four times during the flight. The flight crew action to the first three faults was in accordance with the Electronic Centralized Aircraft Monitor messages. Following the fourth fault, the Flight Augmentation Computer's circuit breakers were reset by the flight crew, resulting in electrical interruption to the computers causing the autopilot to disengage and the flight control logic to change to Alternate Law. The rudder deflected 2 degrees to the left, causing the aircraft to roll up to 54 degrees. Subsequent flight crew actions resulted in the aircraft entering a prolonged stall from which they were unable to recover. Chronological ATC radar data of aircraft track obtained from the Indonesian Ministry of Transportation. Infrared satellite imagery (taken at 7:32 WIB) with flight path superimposed on the right. On this false-colour, water-vapour-band image, blue represents warmer temperatures, while red and ultimately black represent the cold tops of high-altitude clouds. Secondary radar image shows Flight 8501 (circled in yellow) at an altitude of 36,300 ft (11,100 m) and climbing, travelling at 353 kn (654 km/h) ground speed. The crash was dramatized in the 16th season of the TV Series Mayday, in an episode entitled "Deadly Solution", aired just over two years after the crash in early February 2017. ^ Also reported as occurring at 05:36 or 05:32 WIB. ^ Indonesia AirAsia did have permission to fly this route four other days of the week. ^ At least one version of the story claims that Flight 8501 requested to climb, but did not specify to what altitude and that Jakarta Centre asked for an altitude, but no response was given by Flight 8501. ^ The aircraft was an Airbus A320-200 model; the 16 specifies it was fitted with CFM International CFM56-5B6 engines. ^ Dual British-Hong Kong citizen boarding with British passport. ^ Iriyanto is a mononym (one-word name), which is common for Indonesian names. ^ At 10:05 UTC, Reuters, quoting Indonesian official Manahan Simorangkir, reported that 40 bodies had been recovered, but this was later retracted by an Indonesian navy spokesman as a "miscommunication by staff". ^ The Indonesian Agency for Meteorology, Climatology and Geophysics speculated in the days immediately after the accident that atmospheric icing "which can cause engine damage due to a cooling process" was believed to be a significant factor, but this proved to be incorrect. ^ no by-line.--> (28 December 2014). "Database – Accident Description". Air Safety Network. Air Safety Network (ASN). Retrieved 22 December 2015. ^ "AirAsia QZ8501: More bad weather hits AirAsia search". BBC News. 1 January 2015. ^ a b "AirAsia 8501 crash: Official search for bodies ends". BBC. 17 March 2015. Archived from the original on 18 March 2015. Retrieved 17 March 2015. ^ a b Karmini, Niniek (1 December 2015). "AirAsia crash caused by faulty rudder system, pilot response, Indonesia says". Toronto Star (The Associated Press). Toronto, Canada. Retrieved 1 December 2015. ^ Sherwell, Philip (1 December 2015). "Pilots responding to malfuctioning plane part caused AirAsia crash which killed 162 passengers off Indonesia". The Telegraphy. London, England. Retrieved 1 December 2015. ^ Lamb, Kate (1 December 2015). "AirAsia crash: crew lost control of plane after apparent misunderstanding". The Guardian. London, England. Retrieved 1 December 2015. ^ a b Sentana, I Made; Raghuvanshi, Gaurav (29 December 2014). "Search for Missing AirAsia Flight 8501 Resumes". Wall Street Journal. Retrieved 29 December 2014. ^ "Tweet". Twitter (in Indonesian). Kementerian Perhubungan Republik Indonesia (Indonesia Transport Ministry). 28 December 2014. Retrieved 29 December 2014. ^ a b "AirAsia 8501 Missing: Timeline of Events". ABC News. 28 December 2014. Retrieved 29 December 2014. ^ a b c "AirAsia QZ8501: Search teams find more bodies at sea". BBC News. 2 January 2015. Retrieved 3 January 2015. ^ a b c d Hradecky, Simon (28 December 2014). "Crash: Indonesia Asia A320 over Java Sea on Dec 28th 2014, aircraft lost height and impacted waters". avherald.com. Retrieved 5 January 2015. ^ "AirAsia Flight 8501:Preliminary meteorological analysis". Weather Graphics. Retrieved 28 December 2014. ^ "AirAsia jet carrying 162 missing on way to Singapore". CNN. Retrieved 28 December 2014. ^ Leung, Nancy (29 December 2014). "Missing AirAsia Flight QZ8501: At a glance". CNN. Retrieved 29 December 2014. ^ Bengali, Shashank (28 December 2014). "AirAsia Flight 8501 probably 'at bottom of sea,' official says". Los Angeles Times. Retrieved 29 December 2014. ^ "AirAsia Indonesia flight QZ8501 to Singapore missing". BBC News. Retrieved 28 December 2014. ^ "AirAsia flight QZ8501: Was plane flying too slow for its altitude?". The Straits Times. 29 December 2014. Retrieved 30 December 2014. ^ a b "QZ8501 flight path not safe, says aviation expert". The Malaysian Insider. Edge Insider Sdn Bhd. 30 December 2014. Archived from the original on 6 January 2015. Retrieved 5 January 2015. ^ a b c d e "AirAsia Plane Often Experiences Trouble, Former Pilot Says". Tempo. 25 January 2015. Retrieved 25 January 2015. ^ a b c d e Hradecky, Simon (30 December 2014). "Crash: Indonesia Asia A320 over Java Sea on Dec 28th 2014, aircraft went missing believed to have impacted waters". The Aviation Herald. Retrieved 30 December 2014. ^ Schabner, Dean; McGuire, Bill; Candea, Ben (28 December 2014). "Search and Rescue Operation Resume for Missing AirAsia Jet". ABC News. Retrieved 28 December 2014. ^ "AirAsia jet with 162 on board goes missing on way to Singapore". CNN International Edition. 28 December 2014. Archived from the original on 28 December 2014. Retrieved 28 December 2014. ^ "AirAsia QZ8501: Indonesia plane search resumes". BBC. 29 December 2014. ^ "AirAsia flight from Indonesia to Singapore loses contact". The Sydney Morning Herald. 29 December 2014. Retrieved 30 December 2014. ^ a b "AirAsia jet's alarms 'screaming' at crash". The Sydney Morning Herald. AFP. 21 January 2015. Retrieved 21 January 2015. ^ Nusatya, Chris; Fabi, Randy (28 December 2014). "AirAsia flight carrying 162 people goes missing in Southeast Asia – officials". Reuters. Retrieved 28 December 2014. ^ "Live: AirAsia flight from Indonesia to Singapore loses contact with air traffic control". ABC News. AU: Australian Broadcasting Corp. 28 December 2014. Retrieved 28 December 2014. ^ "AirAsia flight QZ8501 from Indonesia to Singapore loses contact with air traffic control". The Australian Broadcasting Corp. 28 December 2014. Retrieved 30 December 2014. ^ "QZ8501: Singapore activated coordination centre to assist in SAR". The New Straits Times Press (M) Berhad. 28 December 2014. Retrieved 30 December 2014. ^ "Seat options". Indonesia AirAsia. Retrieved 28 December 2014. ^ "[Updated statement] QZ8501 (as at 6:54pm, GMT+8)". AirAsia Facebook. 28 December 2014. Retrieved 28 December 2014. ^ Chan, Samuel (29 December 2014). "Hong Kong resident among passengers on missing AirAsia flight". South China Morning Post. Retrieved 30 December 2014. ^ a b AirAsia. "AirAsia Indonesia Flight QZ8501". Retrieved 28 December 2014. ^ "LIVE BLOG: AirAsia QZ8501 from Indonesia to Singapore missing". Channel NewsAsia. 28 December 2014. Archived from the original on 28 December 2014. Retrieved 28 December 2014. ^ "AirAsia flight QZ8501: Pilot Iriyanto was one of military academy's best graduates". Straits Times. 30 December 2014. Retrieved 31 December 2014. ^ M. Pf. avec AFP. "Crash d'Air Asia : «Enfant, il voulait être pilote», témoigne la mère de Rémi Plésel" (Archive). Le Parisien. 29 December 2014. Retrieved on 31 December 2014. ^ "Le copilote de l'avion d'AirAsia disparu entre l'Indonésie et Singapour est un martiniquais" (Archive). Martinique 1ère (FR). 28 December 2014. Retrieved on 31 December 2014. ^ Patience, Martin (4 January 2015). "AirAsia QZ8501: 41 people are missing from one church". BBC. Retrieved 23 March 2018. ^ "QZ8501: Body of first victim identified". Astro Awani. 1 January 2015. Retrieved 5 May 2015. ^ "Indonesian portal reports of plane crash in Belitung Timur". Archived from the original on 28 December 2014. Retrieved 28 December 2014. ^ "AirAsia flight QZ8501: Last position believed to be between Belitung island and Kalimantan". 28 December 2014. Retrieved 28 December 2014. ^ "BREAKING: AirAsia flight QZ8501 with 162 on board goes missing after take-off". YouTube. Retrieved 28 December 2014. ^ "Basarnas Fokus Cari Pesawat AirAsia di Sekitar Pantai Tanjung Pandan dan Pontianak". Kompas. Retrieved 28 December 2014. ^ "Basarnas dispatches vessel for AirAsia search operation". The Jakarta Post. 28 December 2014. ^ "Cari Pesawat AirAsia, TNI AU Kerahkan Boeing 737 Surveillance". Kompas. Retrieved 28 December 2014. ^ "Empat Kapal Perang TNI Angkatan Laut Dikerahkan Cari AirAsia QZ 8510". Kompas. Retrieved 28 December 2014. ^ "TNI AD Diminta Cari AirAsia QZ 8501 dari Darat Hingga Pegunungan". Kompas. Retrieved 28 December 2014. ^ "AirAsia flight QZ8501 with 162 people on board goes missing after takeoff from Indonesia on the way to Singapore, search and rescue underway". National Post. 27 December 2014. Retrieved 28 December 2014. ^ "Search called off for day 1 due to darkness and bad weather". Asian Correspondent. 29 December 2014. Archived from the original on 28 December 2014. ^ "Basarnas Kendalikan Posko Taktis Pencarian AirAsia QZ 8501 di Pangkal Pinang". Kompas. Retrieved 28 December 2014. ^ "Missing AirAsia plane: Bodies recovered by Indonesian military in seas off Borneo island, crash site of airliner". NYDailyNews. Retrieved 3 January 2015. ^ "Media Release". Civil Aviation Authority of Singapore. Retrieved 28 December 2014. ^ a b "Live updates: AirAsia Flight QZ8501 missing". Today. Retrieved 28 December 2014. ^ "Low Tiong Lai on Twitter". Twitter. Retrieved 28 December 2014. ^ "Malaysia to aid Indonesia, sends three military vessels, aircraft to search for missing AirAsia plane". Mail Online. Retrieved 28 December 2014. ^ "QZ8501: Malaysia hantar tiga kapal, satu pesawat dalam operasi SAR". Astro Awani. Retrieved 28 December 2014. ^ Binskin, Mark (29 December 2014). "Mak Binskin – Twitter". Twitter. Retrieved 29 December 2014. ^ "India Puts Military Assets on Standby for Missing AirAsia Jet". WSJ. 29 December 2014. ^ "AirAsia QZ8501: US warship to join search for missing aircraft; oceanographer confident plane will be found". ABC News (Australia). Australian Broadcasting Corporation. 30 December 2014. Retrieved 30 December 2014. ^ "USS Fort Worth joins destroyer Sampson in AirAsia search and recovery". Stars and Stripes. 3 January 2015. Retrieved 3 January 2015. ^ "AirAsia flight QZ8501: icing of engines likely cause of crash, says agency". The Guardian. Retrieved 5 May 2015. ^ Johnston, Chris (24 January 2015). "AirAsia flight QZ8501: four more bodies recovered from wreckage". The Guardian. Retrieved 5 May 2015. ^ "AirAsia disaster: pilots disabled computers moments before crash". The Sydney Morning Herald. 29 January 2015. Retrieved 5 May 2015. ^ "AirAsia Indonesia Flight QZ8501 Update (as of 1 January 2015 8:00 PM (GMT+7)". AirAsia Indonesia. Retrieved 1 January 2015. ^ "MSDF destroyers, choppers to help with AirAsia jet search". Japan Times. 10 May 2013. Retrieved 3 January 2015. ^ "Indonesia hopes for Russia divers in search through AirAsia jet crash area". Itar Tass. Archived from the original on 3 January 2015. Retrieved 3 January 2015. ^ "Chinese military jet, vessel join search for missing AirAsia flight". Xinhua. Retrieved 3 January 2015. ^ a b "Pengerahan 2 Kapal Tanker MemaksImalkan Proses Pencarian" (in Indonesian). Basarnas. 2 January 2015. Retrieved 2 January 2015. ^ "Update Posisi Kapal Kemenhub Dalam Pencarian Korban Pesawat Air Asia" (in Indonesian). Indonesian Ministry of Transport. 2 January 2015. Retrieved 2 January 2015. ^ "AirAsia 8501 crash: Official search for bodies ends". ozip. 17 March 2015. Retrieved 5 May 2015. ^ AirAsia. "AirAsia Indonesia Flight QZ8501 | AirAsia". qz8501.airasia.com. Retrieved 21 January 2016. ^ "AirAsia Indonesia 8501 Crash Update On Search And Recovery Operations; Some Remains Indentified [sic]". Youth Health. 17 April 2015. Retrieved 5 May 2015. ^ Pearlman, Jonathan (30 December 2014). "AirAsia QZ8501 wreckage found by fisherman who did not know plane was missing". The Telegraph. Retrieved 30 December 2014. ^ "QZ8501: Objects sighted in Bangka, Pulau Tujuh". New Straits Times Online. 30 December 2014. Retrieved 31 December 2014. ^ "Puing Diduga Air Asia Ditemukan Nelayan Bangka". Tempo (in Indonesian). 30 December 2014. Retrieved 31 December 2014. ^ a b "AirAsia QZ8501: Local fisherman crucial in locating wreckage". The Star Online. 31 December 2014. Retrieved 31 December 2014. ^ "Live Update Pencarian Korban AirAsia QZ8501 Hari Keempat". detikNews. 31 December 2014. Retrieved 31 December 2014. ^ "AirAsia QZ8501: Items resembling plane door, emergency slide spotted in missing plane search, Indonesian authorities say". ABC News. AU: Australian Broadcasting Corp. 30 December 2014. Retrieved 30 December 2014. ^ "Diduga Jasad Korban AirAsia Mengapung di Teluk Kumai". Okezone. Retrieved 30 December 2014. ^ "AirAsia QZ8501: Officials say debris is missing plane". BBC News. 30 December 2014. Retrieved 30 December 2014. ^ "Search for Flight QZ8501: 30 December 2014". News. BBC. Retrieved 30 December 2014. ^ "AirAsia QZ8501: Multiple bodies recovered in the search for missing plane, National Search and Rescue Agency spokesman says". ABC News. AU: Australian Broadcasting Corp. 31 December 2014. Retrieved 31 December 2014. ^ Otto, Ben; Stacey, Daniel; Pasztor, Andy (30 December 2014). "Debris From Missing AirAsia Plane Found". The Wall Street Journal. Retrieved 31 December 2014. ^ "AirAsia flight QZ8501: Little headway in search ops due to bad weather; 7 bodies found so far". The Straits Times. 31 December 2014. Retrieved 31 December 2014. ^ "Sonar finds location of downed AirAsia Flight 8501". CBS News. 30 December 2014. Retrieved 31 December 2014. ^ "Penemuan 2 Objek Besar Meniadi Titik Terang POSISI Pesawat Air Asia QZ 8501" (in Indonesian). Basarnas. 3 January 2015. Retrieved 3 January 2015. ^ "Four large sections of AirAsia Flight QZ8501 found: 2 January 2015". The Financial Express. Reuters. Archived from the original on 3 January 2015. Retrieved 2 January 2015. ^ a b "Kembali Ditemukan Objek Yang Lebih Besar" (in Indonesian). Basarnas. 4 January 2015. Retrieved 4 January 2015. ^ New Day. 7 January 2015. CNN. ^ Achmad Ibrahim (7 January 2015). "AirAsia Flight 8501: First pictures released of tail found under water". Toronto Star. Associated Press. ^ "BBC News – AirAsia QZ8501: Plane tail lifted from seabed". BBC News. 10 January 2015. Retrieved 10 January 2015. ^ Richard C. Paddock (10 January 2015). "AirAsia Flight 8501: Tail Recovered – WSJ". WSJ. Retrieved 10 January 2015. ^ "AirAsia flight QZ8501: Tail of plane lifted to surface but black box still not found". 10 January 2015. ^ "FDR dan CVR QZ8501 Selesai Diunduh". KEMENTERIAN PERHUBUNGAN REPUBLIK INDONESIA (in Indonesian). 15 January 2015. Retrieved 17 January 2015. ^ "Searchers recover one black box from AirAsia Flight QZ8501, find the other". CNN. 12 January 2015. Retrieved 12 January 2015. ^ "AirAsia Flight QZ8501: Cockpit voice recorder recovered". 13 January 2015. Retrieved 14 January 2015. ^ "Searchers find AirAsia QZ8501's fuselage in Java Sea". CNN. Cable News Network. Retrieved 14 January 2015. ^ "AirAsia QZ8501: Fresh bid to raise fuselage fails". BBC News. 25 January 2015. Retrieved 19 May 2016. ^ a b "Underwater search for AirAsia flight QZ8501 resumes". The Guardian. 5 January 2015. Retrieved 5 May 2015. ^ "QZ8501". AirAsia (updated statement). Facebook. 28 December 2014. Retrieved 28 December 2014. ^ "Menhub: Semua Kapal Diminta Beritahu jika Ada Informasi Pesawat Jatuh". Kompas. Retrieved 28 December 2014. ^ "Posko Penumpang AirAsia QZ 8501 Juga Dibuka di Bandara Soekarno-Hatta". Kompas. Retrieved 28 December 2014. ^ "Angkasa Pura 1 Makassar Buka Posko Informasi AirAsia QZ 8501". Kompas. Retrieved 28 December 2014. ^ "Indonesia AirAsia Retires Flight Number QZ8501/8502 from 31DEC14". airlineroute.net. Archived from the original on 31 December 2014. Retrieved 2 January 2015. ^ Tony Fernandes (1 December 2015). "Investigation determines cause of AirAsia crash last December". Twitter. Retrieved 1 December 2015. ^ a b Karmini, Niniek (1 December 2015). "AirAsia crash caused by faulty rudder system, pilot response, Indonesia says". Toronto Star. Toronto, Canada. Retrieved 1 December 2015. ^ Wellman, Alex; Shammas, Alex. "11:00 Airbus waiting to comment". The Mirror. Mirror Online. Retrieved 1 December 2015. ^ "AirAsia Surabaya-Singapore service given approval at Singapore end". Channel NewsAsia. Archived from the original on 4 January 2015. Retrieved 4 January 2015. ^ "AirAsia flight QZ8501 search area expanded". BBC News. 6 January 2015. Retrieved 6 January 2015. ^ "Fixing the Air Navigation System". Indonesia Infrastructure Initiative. Suara Pembaruan. Retrieved 26 January 2015. ^ Stacey, Daniel (15 January 2015). "Indonesian Air-Traffic Control Is Unsophisticated, Pilots Say". The Wall Street Journal. Retrieved 26 January 2015. ^ "West Kotawaringin to build AirAsia crash memorial". The Jakarta Post. Retrieved 5 May 2015. ^ "AIRASIA FLIGHT QZ8501: CREW, PASSENGERS AND FAMILIES". Channel News Asia. 28 December 2014. Retrieved 5 May 2015. ^ "Monash Gives Honorary Degree to Kevin Soetjipto". ozip. Retrieved 5 May 2015. ^ "Keluarga Korban Peringati 1 Tahun Tragedi Jatuhnya Pesawat AirAsia" (in Indonesian). VOA Indonesia. 28 December 2015. Retrieved 27 August 2016. ^ Salam Wiyono, Adrian (28 December 2015). "1 Tahun tragedi AirAsia QZ 8501, keluarga korban gelar doa bersama" (in Indonesian). Merdeka. Retrieved 27 August 2016. ^ a b "QZ8501: French judge to probe crash, possible 'manslaughter'". Malay Mail Online. AFP. 31 January 2015. Retrieved 31 January 2015. ^ "Surabaya govt could sue AirAsia over insurance issue". The Jakarta Post. Retrieved 8 February 2015. ^ "10 families sue AirAsia, Airbus over fatal QZ8501 crash". The Malay Online. Retrieved 30 June 2015. ^ "QZ8501: 10 families sue AirAsia, Airbus". Astro Awani. Retrieved 1 July 2015. ^ Tan, Andrea (30 June 2015). "Airbus Sued by AirAsia Crash Families Over Defective Systems". Bloomberg Business. Bloomberg. Retrieved 1 December 2015. ^ Aris Siswanto et al. v Airbus, SAS et al., 1:15-cv-05486. U.S. District Court, Northern District of Illinois (Chicago). ^ "AirAsia crash makes case for ejectable black boxes". Reuters. 8 January 2015. Retrieved 14 January 2015. ^ "Air Asia Incident Causes Decline in Foreign Visitor Number". Tempo. 2 April 2015. Retrieved 5 May 2015. ^ Koren, Marina (1 December 2015). "What Brought AirAsia Flight 8501 Down?". The Atlantic. The Atlantic Monthly Group. Retrieved 2 December 2015. ^ "Data Recorder From AirAsia Flight Successfully Downloaded". WSJ. 13 January 2015. Retrieved 3 January 2015. ^ "AirAsia flight QZ8501: icing of engines likely cause of crash, says agency". Retrieved 18 May 2015. ^ "Underwater search for AirAsia flight QZ8501 resumesr". The Guardian. 5 January 2015. Retrieved 5 May 2015. ^ "NTSC Airasia QZ8501 – Final Report" (PDF). Archived from the original (PDF) on 1 December 2015. ^ "Rudder malfunction caused AirAsia crash, says panel". Asia Times. 1 December 2015. Archived from the original on 1 December 2015. Retrieved 1 December 2015. ^ a b c "Deadly Solution". Mayday. Season 16. National Geographic Channel. ^ "AirAsia crash: Faulty part 'major factor'". BBC. 1 December 2015. Retrieved 1 December 2015. ^ "Incorrect crew response caused AirAsia A320 Crash – Aviation Analysis Wing". Retrieved 19 May 2016. ^ "Torqued: Air Asia Crash Highlights Risks of In-flight Troubleshooting". Aviation International News. Retrieved 19 May 2016. ^ "AirAsia 8501 CVR Transcript". Retrieved 19 May 2016. ^ Calder, Simon (1 December 2015). "AirAsia flight QZ8501: Catalogue of errors that led to crash revealed". The Independent. London, England. Retrieved 1 December 2015. ^ Kapoor, Kanupriya; Jensen, Fergus (1 December 2015). "Indonesia says faulty part, crew action factors in AirAsia crash". Reuters. Reuters Thomson. Retrieved 2 December 2015. ^ "Aircraft Accident Investigation Report Airbus A320-216; PK-AXC" (PDF). KOMITE NASIONAL KESELAMATAN TRANSPORTASI. 28 December 2014. p. 106. The FAC CBs were not included in the list of the CB allowed in OEB and TDUs to be reset in flight. ^ Siva Govindasamy, Kanupriya Kapoor and Tim Hepher (30 January 2015). "AirAsia captain left seat before jet lost control: sources". Reuters. Retrieved 31 January 2015. ^ "Faulty component, crew action caused crash of AirAsia flight QZ8501: Report". Reuters. Retrieved 1 December 2015. ^ Karmini, Niniek; Press, Associated (1 December 2015). "Faulty part, pilot response blamed for AirAsia crash". CTV News. Bell Media. ^ Cochrane, Joe (1 December 2015). "Indonesia Cites Resetting of Circuit Breaker in 2014 AirAsia Crash". The New York Times. Retrieved 1 December 2015. ^ Yosephine, Liza (13 December 2015). "Government to tighten regulations following AirAsia accident". The Jakarta Post. Jakarta. Retrieved 3 December 2015. "Indonesian crash report shows AF447's lessons not learned". Flight Global. 4 December 2015. "AirAsia mourns with grey logo after QZ8501 goes missing". Archived from the original on 28 December 2014. Retrieved 28 December 2014. "Changi Airport". Facebook. Retrieved 29 December 2014. "Air Asia Indonesia flight QZ8501" (news update). Twitter. Retrieved 31 December 2014. "AirAsia". Twitter. 27 December 2014. Retrieved 30 December 2014.